The robust nature of Profi TI series air hoists from J D Neuhaus (JDN) ensures their suitability for a whole host of general industrial applications. JDN’s Profi TI series is extensive, but models from TI 3 to TI 25 (providing 3 to 25 tonne lift/load capacity) are ideal for general purpose use, even in continuous working processes. These units can be outfitted with many accessories to meet end user needs. Some of these accessories are various control systems (including remote control) for precise positioning of loads, and a variety of trolleys available to meet specific demands. Profi TI hoists offer many advantages. These easy-to-operate, low-headroom, lightweight hoists are suitable for hazardous area applications and are impervious to dust, vapour, humidity and working temperatures ranging from -20 to +70°C. Profi TI hoists work uninterrupted with extended duty cycles (100% duty rating), and have fail-safe starting and overload protection. These benefits are further enhanced by the need for only minimal maintenance to achieve optimal performance. Profi TI hoists utilise a low-maintenance vane motor, and maintenance-free dust proof ball bearings for the chain sprocket, while the patented motor-brake system is designed to produce little wear. 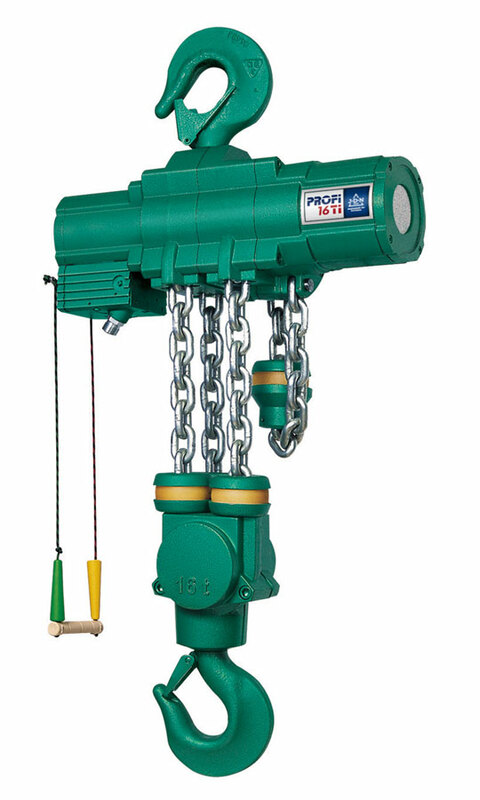 The planetary gearbox utilises long-life grease lubrication with all teeth made of tempered or hardened high-grade steel, while the chain and hook are also made from high-quality tempered steels with a breaking strength of five times the nominal designated load. An integrated emergency main air stop for this series, along with the above design features emphasise the fact that safety is the number one priority at JDN and for their Profi hoists. In total, six models are available for general industrial applications, 3 TI, 6 TI, 10 TI, 16 TI, 20 TI and 25 TI, with the numeral designating the carrying capacity in tonnes. 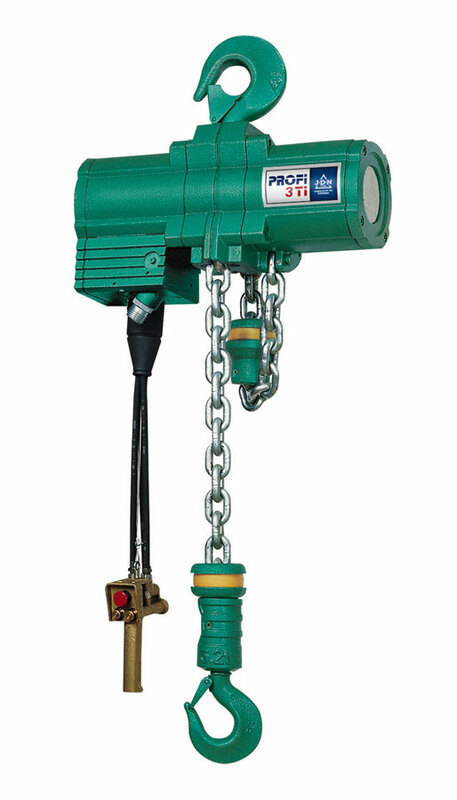 For other applications, Profi TI hoists are available in lighter carrying capacities (from 250kg) as well as in heavier versions (with up to a full 100 tonne capacity). 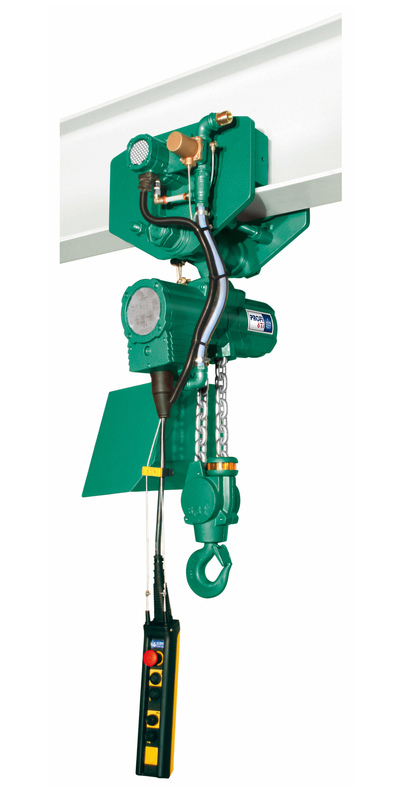 All of JDN’s Profi TI hoists are also available in a hydraulic drive version. Typical applications include aircraft construction, general assembly lines, dairies, electroplating lines, offshore platforms, paint shops, power plants, refineries, sawmills, shipyards and tempering plants. They are also used in a host of uses in the chemical, explosives, food, furniture, glass, oil storage, paper, textile industries, and other industries. End users in these markets enjoy strong, fast, silent, oil-free hoist operation with high levels of efficiency. JDN hoists are purpose-designed to offer the industry’s most efficient air consumption rates, providing a significant contribution to reducing TCO (total cost of ownership). Profi TI hoists also feature no protruding control hoses or parts susceptible to damage, making them equally suitable for horizontal pulling.